» Iron Therapy in Heart Failure: Ready for Primetime? Iron Therapy in Heart Failure: Ready for Primetime? There is an increasing awareness of the prevalence of iron deficiency (ID) in patients with heart failure (HF) and its contributory role in the morbidity and mortality of HF. It is important to note that many HF patients have ID without being anaemic, hence it is vital to screen for ID even in patients with haemoglobin within the normal laboratory range. This review summarises the pathophysiology and epidemiology of ID in HF before discussing the evidence for iron replacement therapy in HF patients. Finally, it discusses the ongoing large outcome trials evaluating iron replacement in HF. AT and CCL have no conflicts of interest to declare. IM is supported by a NHS Education for Scotland/Chief Scientist Office Post-Doctoral Clinical Lectureship (PCL 17/07). Despite advances in the management of heart failure (HF), a significant burden of mortality and morbidity remains.1 This, combined with the ever-escalating costs of novel drug development, has led to an increased focus on the treatment of comorbidities in order to improve outcomes. As a chronic condition, it is increasingly recognised that HF is actually an iron-deficient state, and is highly prevalent, similar to patients with chronic kidney disease and chronic rheumatological conditions in whom iron therapy is an established part of management. In this review article, we discuss the epidemiology and pathophysiology of iron deficiency (ID) in HF and the current evidence for its utility. Iron is an important micronutrient that is required by every cell in the body for metabolism. It has a number of important roles that contribute to metabolic health. First, iron is able to transfer between the ferrous (Fe2+) and ferric (Fe3+) states, allowing it to act as a catalyst for important biochemical reactions.2 Iron is a component of haemoglobin and thus plays a key role in tissue oxygenation. It is also a component of myoglobin, which is an oxygen-binding protein found in skeletal muscle and myocytes, allowing oxygen release in hypoxic conditions.3 In addition to being a constituent of haemoglobin, iron plays a key role in erythropoiesis, via hepcidin, which is produced in the liver and regulates iron absorption in the gastrointestinal tract and iron release from reticuloendothelial tissue. ID leads to a reduction in maturation of haematopoietic cells and resistance to erythropoietin, a renally produced cytokine that increases red blood cell development.4 Iron is also a key component of mitochondria, and hence is vital for myocyte energy production. Given these key functions, it is clear to see why targeting ID is an attractive proposition. It is important to note that total body iron is regulated within a narrow therapeutic window and iron overload, such as in haemochromatosis, can be deleterious, causing cardiac and liver toxicity, as well as oxidative stress.5 The average oral intake of iron is around 10–20 mg/day, and around 1–2 mg is absorbed in the duodenum. There is no pathway for iron excretion; however, around 1–2 mg/day is lost through other mechanisms, such as skin desquamation and bleeding.6 Once absorbed, intracellular iron exists in the ferrous form (Fe2+), while extracellular iron is in the ferric form (Fe3+). Iron is described as either stored (as ferritin within the liver, bone marrow and spleen) or utilised (circulating and intracellular iron).7 Circulating iron is bound to transferrin, which delivers iron to tissues for utilisation or storage, while most intracellular iron is within haemoglobin. In a study of explanted hearts, iron stores within the hearts of HF patients due for cardiac transplant were found to be depleted compared to healthy controls.16 Furthermore, a reduction in soluble transferrin receptor was found in response to increased levels of aldosterone and noradrenaline, which are commonly elevated in HF. It is important to note that many HF patients have ID without being anaemic, hence it is vital to screen for ID, even in patients with haemoglobin within the normal laboratory range. The gold standard for the assessment of total body iron stores and diagnosis of ID is bone marrow aspiration with Prussian blue staining. However, this is clearly not practical in the routine setting, particularly if repeated testing is required. The use of serum markers is much more common. Typically, two parameters are used in the assessment of ID: ferritin and transferrin saturation. Serum iron levels can also be measured. Levels vary widely, even from hour to hour, so it is recommended that serum iron levels should not be used for the assessment of ID.21 A recent study by Grote Beverborg et al. compared a variety of iron-associated biomarkers against the gold standard of bone marrow biopsy in 42 patients with HF and found that transferrin saturation ≤19.8 % or serum iron ≤13 µmol/l actually had better diagnostic performance than the current definition using serum ferritin, and also had independent prognostic significance in in 387 outpatients with HF.22 One test that has recently been proposed for the diagnosis of ID is serum-soluble transferrin receptor (ssTR) level, which is not affected by inflammation and appears to correlate very well with iron status, being more sensitive but less specific than serum ferritin (although ferritin cut-offs varied within the meta-analysis from which these data were derived).23,24 Despite showing promise, this test is not widely available. There has not yet been any definite incremental benefit to using ssTR above traditional measures of iron status, hence at present serum ferritin and transferrin saturations remain the most useful diagnostic tests. Most studies have focused on HF with reduced ejection fraction (HFrEF). In acute HF, ID appears to be associated with both short- and intermediate-term risk of mortality.34 The presence of absolute (but not functional) ID has been shown to be independently associated with an increased risk of readmission within 30 days in a study of 693 patients admitted to hospital with acute HF.35 Interestingly, in this study over half of the patients had HF with preserved ejection fraction (HFpEF). The adverse effects of ID are less well described in HFpEF; however, in the large multicentre study by Klip et al. there was no significant interaction between ejection fraction and the impact of ID (p=0.3), although this may have been due to numbers as only 13 % of the patients included had preserved ejection fraction.8 More recently a study of 1,197 patients, including 229 with HF with mid-range ejection fraction and 72 with HFpEF, found that ID was associated with lower exercise capacity and increased mortality regardless of left ventricular ejection fraction (LVEF).36 These results suggest that iron replacement may be of benefit in HFpEF and acute HF patients as well as HFrEF patients, and have led to the growing interest in iron replacement to improve outcomes. Oral iron therapy, most commonly given as ferrous sulphate or ferrous fumarate, is relatively inexpensive and widely used. However, there are limitations with oral administration, not least the low gastrointestinal absorption of iron and its limited tolerability. This intolerance is produced, at least in part, by oxidative damage of the mucosal boundary when iron is oxidised from Fe2+ to Fe3+.37 This causes side-effects such as constipation, diarrhoea and dyspepsia in up to 60 % of patients prescribed oral iron. Additionally, oral iron can take a long time to replenish iron stores, particularly if there is ongoing iron loss at the same time. It appears that oral iron is unlikely to be efficacious in HF patients. A recently-published randomised trial by Lewis et al. evaluated 225 patients with HFrEF and ID (absolute or functional) who were given 16 weeks of oral iron or placebo and found no difference in exercise capacity (peak VO2 or 6-minute walk test), NT-proBNP or Kansas City Cardiomyopathy Questionnaire.38 In addition to this, there was minimal improvement in iron stores in the group given iron, suggesting that oral iron replacement is unlikely to be of benefit. A much smaller trial randomised 18 patients with ID anaemia to receive intravenous (IV) iron (iron sucrose 200 mg weekly for 5 weeks), oral iron (ferrous sulphate 600 mg/day for 8 weeks) or oral placebo and found that although there was no significant difference in the increase in haemoglobin between the groups, VO2 only increased in the group given IV iron.39 The results from these trials are consistent with prior trials where oral iron has been given with erythropoietin or darbepoetin, where in the groups given oral iron therapy alone there have been no significant improvements in exercise capacity or symptoms.40,41 Given these results, focus has now switched to IV iron replacement. The largest trial reported to date was the Ferinject® Assessment in patients with IRon deficiency and chronic Heart Failure (FAIR-HF) study.45 This was a randomised trial of 459 patients with HF (LVEF <45 %) and ID (absolute or functional) with haemoglobin in the 95–135 g/l range randomised to ferric carboxymaltose or placebo. The study met its primary endpoint, with those patients receiving IV iron significantly more likely to have improved self-reported Patient Global Assessment at 6 months (50 % versus 28 %, p<0.001). There were also significant improvements in NYHA class and 6-minute walk test. These results were independent of the presence of anaemia. These results were replicated in the Ferric CarboxymaltOse evaluatioN on perFormance in patients with IRon deficiency in coMbination with chronic Heart Failure (CONFIRM-HF) trial, a study of 304 patients with HF and ID in which participants were randomised to IV ferric carboxymaltose or placebo. The CONFIRM-HF trial authors reported significant improvements in 6-minute walk test, NYHA class and QoL, as well as time to first hospitalisation.46 Most recently, the Effect of Ferric Carboxymaltose on Exercise Capacity in Patients with Chronic Heart Failure and Iron Deficiency (EFFECT-HF) trial evaluated 172 patients with HF and ID and also suggested an improvement in peak VO2 with IV iron replacement.47 However, there were issues with missing data in this study. Two meta-analyses of randomised trials of IV iron in HF patients with ID have been performed recently to summarise the results of these trials: a standard meta-analysis of five randomised trials including 509 patients and 342 controls,48 and an individual patient data meta-analysis including 504 patients and 335 controls.49 These studies have suggested a significant reduction in all-cause mortality, cardiovascular hospitalisation and HF hospitalisation with IV iron, as well as significant improvements NYHA class, 6-minute walk test and symptom questionnaire scores. The weight of evidence from these randomised trials has led several guideline groups to recommend the consideration of IV iron therapy, (see Table 1). Nevertheless, evidence is still awaited from large outcome trials to determine the long-term prognostic benefit of IV iron replacement in HF. Several of these trials are currently ongoing, (see Table 2), and are likely to report in the near future. Positive results are likely to lead to stronger guideline recommendations to implement IV iron replacement in routine clinical practice. As well as investigating the potential benefit of IV iron on mortality in HF, there are several other questions that remain. First, while the majority of iron replacement studies in HF have included HFrEF patients, whether IV iron replacement is of benefit in HFpEF is unclear. The ongoing FAIR-HFpEF trial will provide further insight on this (NCT03074591). Second, the efficacy and safety of IV iron replacement in the in-patient setting in acute HF is unknown. Third, whether alternative methods for the diagnosis of ID, such as ssTR, provide any benefit over and above ferritin and transferrin saturations has not been fully evaluated. Fourth, the majority of published studies performed have evaluated ferric carboxymaltose; whether other IV iron preparations provide any benefit, as well as the optimal dose and duration, are yet to be confirmed. In conclusion, ID is common in patients with HF, and may well be underdiagnosed in routine clinical practice. Several trials of IV iron replacement have suggested benefits on exercise capacity and symptoms, so IV iron should be considered in symptomatic HF patients with ID. Several ongoing trials will provide further evidence as to the long-term effects of such treatment on mortality and hospitalisation. Meta-analysis Global Group in Chronic Heart Failure (MAGGIC). The survival of patients with heart failure with preserved or reduced left ventricular ejection fraction: an individual patient data meta-analysis. Eur Heart J 2012;33:1750–7. Andrews NC. Disorders of iron metabolism. N Engl J Med 1999;341:1986–95. Ordway GA, Garry DJ. Myoglobin: an essential hemoprotein in striated muscle. J Exp Biol 2004;207:3441–6. Adamson JW. The relationship of erythropoietin and iron metabolism to red blood cell production in humans. Semin Oncol 1994;21:9–15. Siah CW, Ombiga J, Adams LA, et al. Normal iron metabolism and the pathophysiology of iron overload disorders. Clin Biochem Rev 2006;27:5–16. Anderson GJ, Frazer DM, McLaren GD. Iron absorption and metabolism. Curr Opin Gastroenterol 2009;25:129–35. Jankowska EA, von Haehling S, Anker SD, et al. Iron deficiency and heart failure: diagnostic dilemmas and therapeutic perspectives. Eur Heart J 2013;34:816–29. Klip IT, Comin-Colet J, Voors AA, et al. Iron deficiency in chronic heart failure: an international pooled analysis. Am Heart J 2013;165:575–82 e3. Okonko DO, Mandal AK, Missouris CG, Poole-Wilson PA. Disordered iron homeostasis in chronic heart failure: prevalence, predictors, and relation to anemia, exercise capacity, and survival. J Am Coll Cardiol 2011;58:1241–51. Jankowska EA, Rozentryt P, Witkowska A et al. Iron deficiency: an ominous sign in patients with systolic chronic heart failure. Eur Heart J 2010;31:1872–80. Camaschella C. Iron-deficiency anemia. N Engl J Med 2015;372:1832–43. Nicolas G, Chauvet C, Viatte L, et al. The gene encoding the iron regulatory peptide hepcidin is regulated by anemia, hypoxia, and inflammation. J Clin Invest 2002;110:1037–44. Weber CS, Beck-da-Silva L, Goldraich LA, et al. Anemia in heart failure: association of hepcidin levels to iron deficiency in stable outpatients. Acta Haematol 2013;129:55–61. Jankowska EA, Malyszko J, Ardehali H, et al. Iron status in patients with chronic heart failure. Eur Heart J 2013;34:827–34. van Veldhuisen DJ, Anker SD, Ponikowski P, Macdougall IC. Anemia and iron deficiency in heart failure: mechanisms and therapeutic approaches. Nat Rev Cardiol 2011;8:485–93. Maeder MT, Khammy O, dos Remedios C, Kaye DM. Myocardial and systemic iron depletion in heart failure implications for anemia accompanying heart failure. J Am Coll Cardiol 2011;58:474–80. Rocha LA, Barreto DV, Barreto FC, et al. Serum ferritin level remains a reliable marker of bone marrow iron stores evaluated by histomorphometry in hemodialysis patients. Clin J Am Soc Nephrol 2009;4:105–9. Krause JR, Stolc V. Serum ferritin and bone marrow iron stores. I. Correlation with absence of iron in biopsy specimens. Am J Clin Pathol 1979;72:817–20. Ponikowski P, Voors AA, Anker SD, et al. 2016 ESC Guidelines for the diagnosis and treatment of acute and chronic heart failure: The Task Force for the diagnosis and treatment of acute and chronic heart failure of the European Society of Cardiology (ESC). Developed with the special contribution of the Heart Failure Association (HFA) of the ESC. Eur Heart J 2016;37:2129–200. Fitzsimons S, Doughty RN. Iron deficiency in patients with heart failure. Eur Heart J Cardiovasc Pharmacother 2015;1:58–64. Dale JC, Burritt MF, Zinsmeister AR. Diurnal variation of serum iron, iron-binding capacity, transferrin saturation, and ferritin levels. Am J Clin Pathol 2002;117:802–8. Grote Beverborg N, Klip IT, Meijers WC, et al. Definition of iron deficiency based on the gold standard of bone marrow iron staining in heart failure patients. Circ Heart Fail 2018;11:e004519. Beguin Y. Soluble transferrin receptor for the evaluation of erythropoiesis and iron status. Clin Chim Acta 2003;329:9–22. Braga F, Infusino I, Dolci A, Panteghini M. Soluble transferrin receptor in complicated anemia. Clin Chim Acta 2014;431:143–7. Yeo TJ, Yeo PS, Ching-Chiew Wong R, et al. Iron deficiency in a multi-ethnic Asian population with and without heart failure: prevalence, clinical correlates, functional significance and prognosis. Eur J Heart Fail 2014;16:1125–32. Cleland JG, Zhang J, Pellicori P, et al. Prevalence and outcomes of anemia and hematinic deficiencies in patients with chronic heart failure. JAMA Cardiol 2016;1:539–47. Jankowska EA, Rozentryt P, Witkowska A, et al. Iron deficiency predicts impaired exercise capacity in patients with systolic chronic heart failure. J Card Fail 2011;17:899–906. Ebner N, Jankowska EA, Ponikowski P, et al. The impact of iron deficiency and anaemia on exercise capacity and outcomes in patients with chronic heart failure. Results from the Studies Investigating Co-morbidities Aggravating Heart Failure. Int J Cardiol 2016;205:6–12. Pozzo J, Fournier P, Delmas C, et al. Absolute iron deficiency without anaemia in patients with chronic systolic heart failure is associated with poorer functional capacity. Arch Cardiovasc Dis 2017;110:99–105. Enjuanes C, Klip IT, Bruguera J, et al. Iron deficiency and health-related quality of life in chronic heart failure: results from a multicenter European study. Int J Cardiol 2014;174:268–75. Comin-Colet J, Enjuanes C, Gonzalez G, et al. Iron deficiency is a key determinant of health-related quality of life in patients with chronic heart failure regardless of anaemia status. Eur J Heart Fail 2013;15:1164–72. Martens P, Verbrugge F, Nijst P, et al. Impact of iron deficiency on response to and remodeling after cardiac resynchronization therapy. Am J Cardiol 2017;119:65–70. Bojarczuk J, Josiak K, Kasztura M, et al. Iron deficiency in heart failure: Impact on response to cardiac resynchronization therapy. Int J Cardiol 2016;222:133–4. Jankowska EA, Kasztura M, Sokolski M, et al. Iron deficiency defined as depleted iron stores accompanied by unmet cellular iron requirements identifies patients at the highest risk of death after an episode of acute heart failure. Eur Heart J 2014;35:2468–76. Nunez J, Comin-Colet J, Minana Get al. Iron deficiency and risk of early readmission following a hospitalization for acute heart failure. Eur J Heart Fail 2016;18:798–802. Martens P, Nijst P, Verbrugge FH, et al. Impact of iron deficiency on exercise capacity and outcome in heart failure with reduced, mid-range and preserved ejection fraction. Acta Cardiol 2017:1–9. epub ahead of press. Macdougall IC. Strategies for iron supplementation: oral versus intravenous. Kidney Int 1999;69:S61–6. Lewis GD, Malhotra R, Hernandez AF, et al. Effect of Oral Iron Repletion on Exercise Capacity in Patients With Heart Failure With Reduced Ejection Fraction and Iron Deficiency: The IRONOUT HF Randomized Clinical Trial. JAMA 2017;317:1958–66. Beck-da-Silva L, Piardi D, Soder S, et al. IRON-HF study: a randomized trial to assess the effects of iron in heart failure patients with anemia. Int J Cardiol 2013;168:3439–42. Palazzuoli A, Silverberg D, Iovine F, et al. Erythropoietin improves anemia exercise tolerance and renal function and reduces B-type natriuretic peptide and hospitalization in patients with heart failure and anemia. Am Heart J 2006;152:1096 e9–15. Ghali JK, Anand IS, Abraham WT, et al. Randomized double-blind trial of darbepoetin alfa in patients with symptomatic heart failure and anemia. Circulation 2008;117:526–35. Bolger AP, Bartlett FR, Penston HS, et al. Intravenous iron alone for the treatment of anemia in patients with chronic heart failure. J Am Coll Cardiol 2006;48:1225–7. Toblli JE, Lombrana A, Duarte P, Di Gennaro F. Intravenous iron reduces NT-pro-brain natriuretic peptide in anemic patients with chronic heart failure and renal insufficiency. J Am Coll Cardiol 2007;50:1657–65. Okonko DO, Grzeslo A, Witkowski T, et al. Effect of intravenous iron sucrose on exercise tolerance in anemic and nonanemic patients with symptomatic chronic heart failure and iron deficiency FERRIC-HF: a randomized, controlled, observer-blinded trial. J Am Coll Cardiol 2008;51:103–12. Anker SD, Comin Colet J, Filippatos G, et al. Ferric carboxymaltose in patients with heart failure and iron deficiency. N Engl J Med 2009;361:2436–48. Ponikowski P, van Veldhuisen DJ, Comin-Colet J, et al. Beneficial effects of long-term intravenous iron therapy with ferric carboxymaltose in patients with symptomatic heart failure and iron deficiency. Eur Heart J 2015;36:657–68. van Veldhuisen DJ, Ponikowski P, van der Meer P, et al. Effect of Ferric Carboxymaltose on Exercise Capacity in Patients With Chronic Heart Failure and Iron Deficiency. Circulation 2017;136:1374–83. Jankowska EA, Tkaczyszyn M, Suchocki T, et al. Effects of intravenous iron therapy in iron-deficient patients with systolic heart failure: a meta-analysis of randomized controlled trials. Eur J Heart Fail 2016;18:786–95. Anker SD, Kirwan BA, van Veldhuisen DJ, et al. Effects of ferric carboxymaltose on hospitalisations and mortality rates in iron-deficient heart failure patients: an individual patient data meta-analysis. Eur J Heart Fail 2018;20:12–33. Yancy CW, Jessup M, Bozkurt B, et al. 2017 ACC/AHA/HFSA Focused Update of the 2013 ACCF/AHA Guideline for the Management of Heart Failure: A Report of the American College of Cardiology/American Heart Association Task Force on Clinical Practice Guidelines and the Heart Failure Society of America. J Am Coll Cardiol 2017;70:776–803. Scottish Intercollegiate Guidelines Network. SIGN 147: Management of chronic heart failure. 2016. Available at: www.sign.ac.uk/assets/sign147.pdf (accessed 4 April 2018). National Institute for Health and Care Excellence. 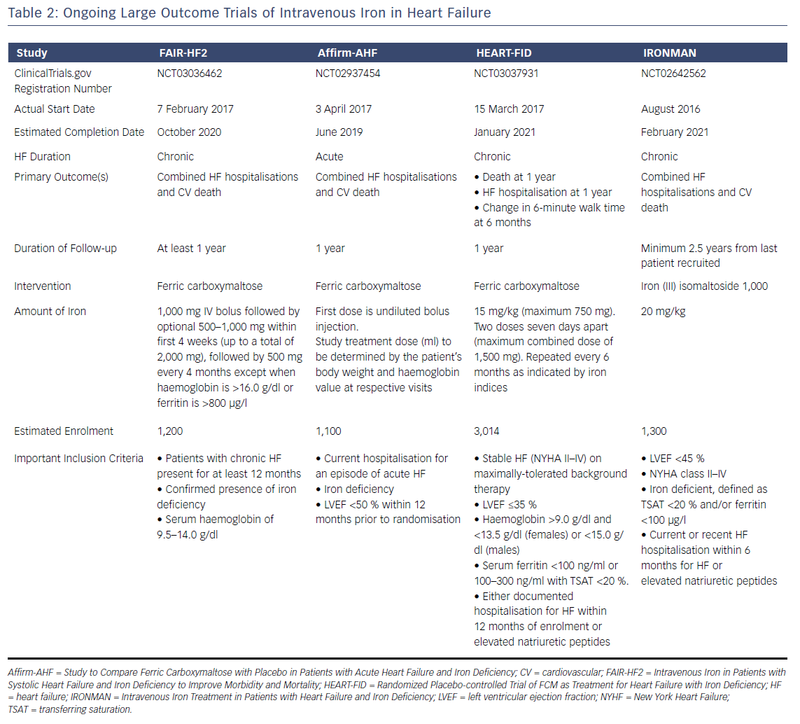 CG108: Chronic heart failure in adults: management. 2010. Available at: www.nice.org.uk/guidance/cg108 (accessed 4 April 2018).